Finally you revisit your favourite stupid and lazy pirates. This time one of your fellow pirates begins boasting that he can dive down into the water further than any other pirate here. Yes, it is a stupid idea. But you cannot let a fellow pirate boast of his greatness when you know you can swim deeper then he can. Are you going to chicken out play it safe? No way! 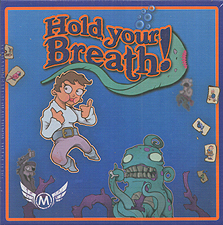 With a quick play time of 15 minutes for 2-4 pirates "Hold Your Breath!" is great pirate fun for the whole family!